Hillary Omala is a public health policy advocate with over 10 years of experience in the areas of health systems strengthening, strategic planning, community development, program management and institutional capacity strengthening. Omala’s experience is extensive and diverse – from new project start up to successful turnaround of established operations of diverse community projects and service delivery systems. Omala has served in various senior management capacities and as Board member in different organizations. Currently, he is the Executive Director at CFK. 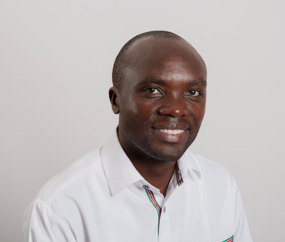 He previously served as Policy and Partnerships Director at Lwala Community Alliance, Executive Director at Kakenya’s Dream and as the Clinic Services Manager at the KEMRI/CDC Program. Hillary Omala is a Master of Public Health Finalist at the University of Nairobi, majoring in Health Economics and Policy Development and is currently undertaking research in the area of healthcare financing. He also holds a B.A (Sociology and Communication) from the University of Nairobi.